Biotech startup company Wild Earth have announced a successful round of funding with investment from Pathfinder, which is the investment vehicle of Founders Fund, and Paypal founder Peter Thiel. This round of funding totalled $450,000, meaning that Wild Earth have now received funding to the tune of almost $5 million. CEO of Wild Earth, Ryan Bethencourt, is part of the self-labelled Vegan Mafia group whose members are former financiers, entrepreneurs and bio-tech investors who have the shared aim of removing animals from the supply chain. This group have invested in over 70 biotech startups including several cultured protein producers. The specific aim of Wild Earth is to disrupt traditional petfood companies by raising awareness of ethically sourced alternatives. 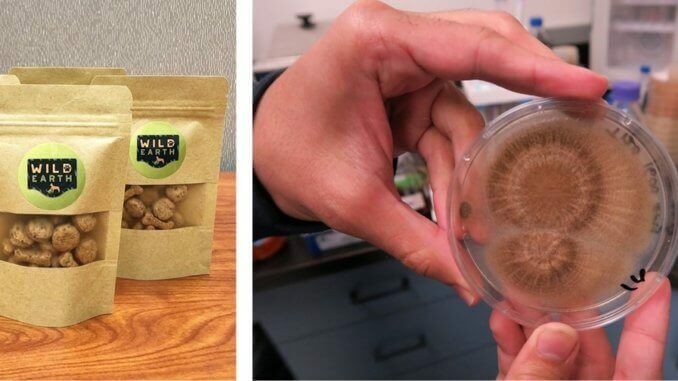 They intend to develop protein food products for both cats and dogs using fungi; their first dog treat is created from an Asian protein called koji and will be on the market from the end of August. Bethencourt describes the current situation with regards to pet food as “staggering” and says that as we feed millions of additional pets over the next 30 years, there will be approximately another billion dogs and cats brought into existence. The global pet food market had a value of around $94 billion last year, and is set to grow as previously impoverished countries such as China follow western trends. He says that these pets can be sustained with koji protein, and in future the plan is to create cultured meat cells from lab-grown meat using mouse cells. 2018 is certainly an interesting time for cultured meat, and if the pet food market can follow this trend it will make an impact on a global problem which is enormously unsustainable at present.